Labor Day Weekend at California’s Great America will be extra special as the park celebrates its 75 Millionth Guest the entire weekend. One lucky winner will be celebrated as the 75 Millionth Guest during Labor Day Weekend and receive a VIP prize package and a key to Great America. There will be collectible gifts with the 75 Millionth Guest logo for the first 7,500 visitors on Saturday, Sunday and Monday. The first 7,500 guests Saturday receive a commemorative pin, the first 7,500 guests Sunday get a vinyl backpack and the first 7,500 guests Monday receive a rally towel. Additionally, there will be 75 commemorative gifts for 75 random park visitors each day. 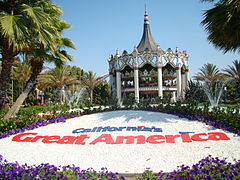 One lucky winner will be celebrated as the 75 Millionth Guest and receive a VIP package and a Golden Key to Great America. There will be fireworks on Saturday and Sunday to make the weekend extra special and Monday will feature an All-You-Can-Eat BBQ ($14.99 per person) from 11am-4pm. Season Pass holders can bring up to 6 guests for just $19.99 each all three days and enjoy Early Ride Time from 9 am-10 am all weekend.